The Office of the Vice Provost for Faculty Affairs typically conducts several Academic Leadership Forums during the fall and spring semesters for University deans, associate deans, department heads, and other academic administrators. The 2018-2019 Academic Leadership Forum Planning Committee helps to identify topics and speakers for the forums. The topics vary each year depending on what contemporary issues are occurring in U.S. higher education and at Penn State. Participation in Academic Leadership Forums is by invitation only. Unless otherwise noted, the forums typically are held on the University Park campus from 8:00 a.m. to 11:30 a.m. or Noon, starting with a continental breakfast. 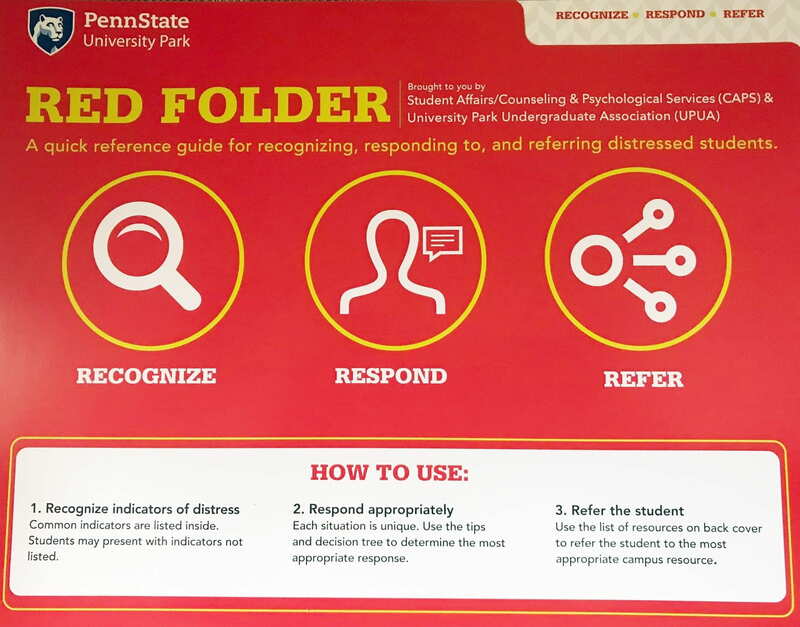 Time: 8:00 – 11:30 a.m.
Counseling and Psychological Services (CAPS), a unit of Penn State Student Affairs, and the University Park Undergraduate Association (UPUA) have worked together to launch the Red Folder initiative, which is designed to provide resources and information to support faculty, staff and administrators in helping distressed students. 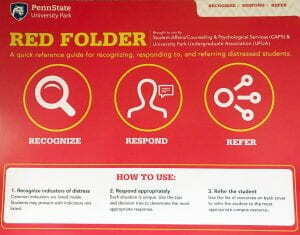 To request or obtain additional Red Folders, please email Kate Staley, Assistant Director of Community Education and Outreach, Counseling and Psychological Services (CAPS), at kxr119@psu.edu. Please provide your name, the campus address to send folders to via interoffice mail, and the number of Red Folders requested. For more information about the Academic Leadership Forums, including presentations and other materials from previous events, contact the Office of the Vice Provost for Faculty Affairs.